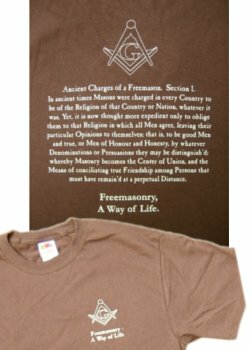 "In Ancient Times, Masons were charged in every Country to be of the Religion of that Country or Nation, whatever it was. Yet, it is now thought more expedient only to oblige them to that Religion in which all Men agree, leaving their particular Opinions to themselves; that is to be good Men and true, or Men of Honour and Honesty, by whatever Denominations or Persuasions they may be distinguish'd; whereby Masonry becomes the Center of Union, and the Means of conciliating true Friendship among Persons that must have remain'd at a perpertual Distance." from the first of Anderson's Constitutions, Section 1. The election of the noble Duke of Montagu as Grand Master was celebrated by Anderson with a revison of the ancient charges from the Middle Ages to create a Constitution more compatible with the religious and political realities of eighteenth century England. Far from being a secret society, public processions of freemasons were widely reported in the press. The rebuilding of St Paul's Cathedral between 1675 and 1708 spanned the reigns of five monachs and was in the architectural style introduced by Inigo Jones during the reign of James I. Appointed by Charles II, Sir Christopher Wren completed the building during the reign of Queen Anne. It was an period marked by a series of crises relating to succession of the Crown and religious polarisation. On 1 May 1707, the Kingdom of Great Britain was formed from the union of England and Scotland. Queen Anne was the last of the line of succession established by the Bill of Rights 1689 after the Invitation to William sent by seven notable Englishmen, later named the Immortal Seven. To ensure a Protestant succession, Parliament had enacted the Act of Settlement 1701, which passed the Crown to Sophia, Electress of Hanover, and her descendants. Sophia was descended from James I of England through his daughter Elizabeth Stuart. There were a series Jacobite Risings in the British Isles between 1688 and 1746, which aimed at restoring James VII of Scotland and II of England, and later his descendants of the House of Stuart. The major Jacobite Risings were known respectively as "The Fifteen" and "The Forty-Five", after the years in which they occurred, 1715 and 1745. This Charge on God and religion was modified after 1813 by the United Grand Lodge of England. A Mason is obliged, by his tenure, to obey the moral law; and if he rightly understand the art he will never be a stupid atheist nor an irreligious libertine. He, of all men, should best understand that God seeth not as man seeth; for man looketh at the outward appearance, but God looketh to the heart. A Mason is, therefore, particularly bound never to act against the dictates of his conscience. Let a man's religion or mode of worship be what it may, he is not excluded from the order provided he believe in the glorious architect of heaven and earth, and practise the sacred duties of morality.